Ethan Lipsitz (C'06, Off the Beat) wants you to experience fabric self-expression from the company he stitched together since his days as an undergrad at Penn. apliiq inc is a new media fashion company that began at Penn and has since moved to LA and is growing steadily online. 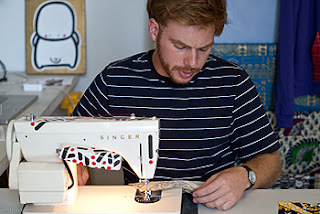 apliiq is based around the process of applique, sewing unique/rare textiles onto simple everyday gear. The site offers exclusive and custom garments and accessories that are unique thanks to the fabrics sewn onto them. apliiq collects textiles from all over the world, each with a distinct story that is translated onto apliiq products. "I used to play with my own hoodies and clothes by stitching old fabrics onto them in a graphic/ architectural way. I stitched a karate kid headband my buddy gave me onto the top of a hoody and some friends liked it, so I made some more for them. From there I began experimenting with lining the entire hood with fabrics I'd buy on Fabric Row in Philly. My friends would come to my room on 42nd and Locust and pick out the fabrics they liked and the hoody they wanted and I'd hand stitch them a hoody. I called the company delph (inspired by Philadelphia - I was an Urban Studies Major and was really into the city). By the end of my senior year I was selling my hoodies at ReLoad Baggage in Northern Liberties, Momoca in Berkeley California and Bodega in Boston. After Penn I moved to Australia having built delphness.com, a website where people could customize their own hoodies. My classmate Jess Casper (Visual Studies 06) helped me keep the business running and filling orders while I was living in Sydney. 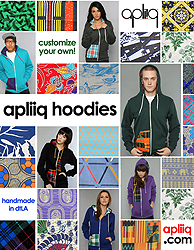 In April 2008 I moved to Los Angeles which has a thriving garment production and textile district and changed the name to apliiq (based off applique and unique). I have been working on the company full time since then. In June 2009 Emily Gruber (Visual Studies/Architecture Minor '08) joined the team as CFO and Audrey Chin (Visual Studies '05) also came on to assist with production. We have a workshop/retail space in downtown LA (on 6th and Spring Street) which is the home base for all operations for apliiq.com." Tour Penn's Campus in Google Maps!